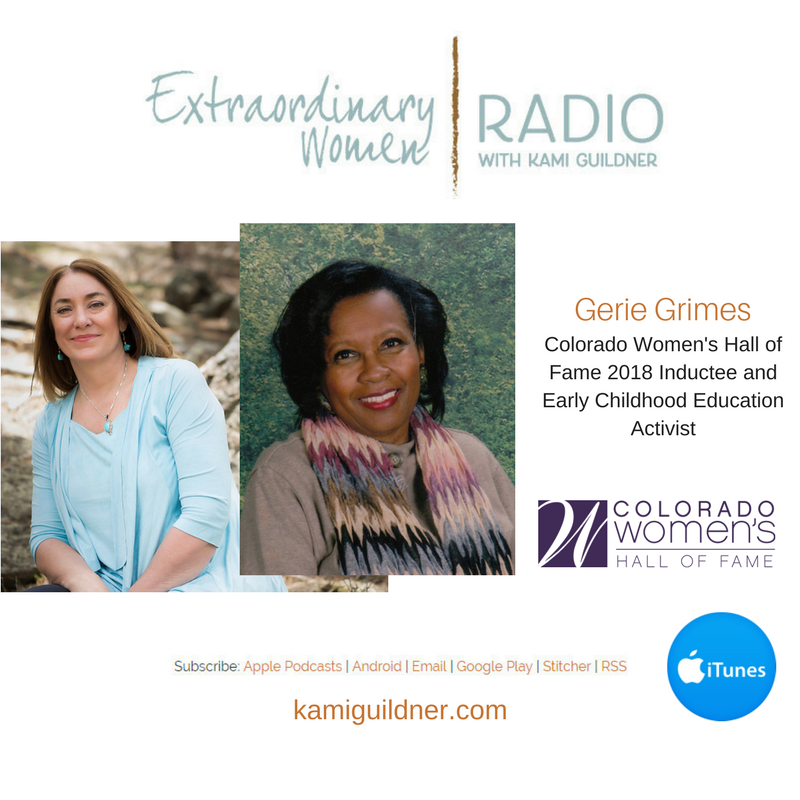 I’m really excited about today’s Extraordinary Women Radio interview with Gerie Grimes – the first of the 2018 Inductees to the Colorado Women’s Hall of Fame. Passion, commitment, spirit, grit and grace. These are some of the characteristics shared by the women that will be enshrined into the Colorado Women’s Hall of Fame in March 2018. These characteristics: Passion, commitment, spirit, grit and grace – are so aligned with what I want to share here at Extraordinary Women Radio. So you can see why I couldn’t be more thrilled to partner with the Colorado Women’s Hall of Fame to be able to tell these stories! In March 2018, Colorado will induct 10 new women into their Hall of Fame – something that is done every other year… six contemporary honorees and four historical, into an exclusive class that has now grown to 152. My friend Beth Barela, who is the chair of the Colorado Women’s Hall of Fame says, “These women are unsung heroes who have endured with superlative strength, beauty and love. They deserve to have their stories told and to be honored as shining examples of the potential of all women.” Over the next few months, I’ll be bringing you the stories of the 6 contemporary women who will be honored at the March 28, 2018 Induction Gala. Today’s guest, Gerie Grimes is the first inductee that I’m featuring. Gerie is an early childhood education activist and leader of Colorado’s nonprofit the Hope Center. She has dedicated 36 years of her life to Hope Center and to creating the opportunity for all children to have a better early childhood education experience. She has led Hope Center for the past 12 years as President and CEO. Her leadership, intelligence and expertise has made Denver’s Hope Center a model for how all children deserve the best education – no matter race or level of capability that society has labeled them. We talk about how important it is to be a voice at the table – even when the conversations are hard… leading change when we want to make a difference, the importance of reaching out and helping others, and of course we end with three pearls of wisdom from Gerie, which are particularly rich. I’m excited to be learning from these trailblazing women! Gerie is very active in the Denver Metro community serving presently and in the past on many boards and committees, such as, Center for African American Health, Denver Early Childhood Council, Colorado Association for the Education of Young Children, National Black Child Development, Denver Affiliate, Transforming the ECE Workforce (National efforts), Denver Preschool Program advisory board, Holly Area Redevelopment Project (HARP), East5ide Unified Leadership Team, North Park Hill Collaborative Impact, Mayor’s Head Start Policy Council, Mayor’s Early Childhood Education Commission, Metro State Board of Trustees, Metro State Alumni Board, Colorado Black Women for Political Action, Colorado Black Roundtable, Falcons Youth Organization (Founder and President for 27 years has volunteer with the Falcons for 42 years) and the Police Activities League. Mrs. Grimes has received numerous awards for community service over the years, some awards are: MLK Peace Award, 2013, Minoru Yasui Community Service award, 2011, Mary McLeod Bethune Award of Achievement, 2013, Juanita R. Gray Community Service Award, 2012; Kathy Hill Young Community Spirit Award, 2010; The 2011 Children’s Champion Award; 2014 William Funk Award for Building Stronger Communities; Mile High United Way – Anna Jo Haynes Caring about Kids Award 2013. To learn more about the Hope Center, visit their web site.